Nyt luksus hjem for op til 12 gæster. Varmt vand, blå himmel - du ved, du ønsker at være her. Der er rodeo, klassiske bil viser, golf, og den nærliggende Silverwood Theme Park, som kombinerer gyset rider med et stort vandland. Off season rabatter kan være tilgængelige. Ugen fra august 10 til august 17 åbnede. Venturing længere væk er dagsture til Priest Lake eller rafting de Clark Fork eller Spokane floder, vandreture i regeringen eller Selkirk Mountains, antikke markeder, varme kilder, vingårde, og en række af sommerens speciale messer. Mens byen Sandpoint er relativt lille, de mange forskellige restauranter er sikker på at give nok valg for kræsne paletter. Vores hjem er alt nybyggeri i 2014. Rummelig, men afslappet. Mange brugerdefinerede opførelse, indbygget siddepladser og opbevaring, alt er blevet designet til moderne komfort og maksimal udsigt over søen og sjov. Den åbne grundplan giver masser af plads til madlavning og underholdende på de vigtigste etage, enten i eller uden. Badeværelserne er brugerdefinerede flisebelagt med gulvvarme, store brusere og multi-head bruser jetfly. Bad og strand håndklæder leveres. Shower gel, shampoo og balsam, håndsæbe, vaskeri sæbe, papirvarer fuldt lager. Køkken, spiseplads og stue flyder sammen, med alle sikrer udsigt adgang til en mur af vinduer mod vandet. Det er bare et par skridt til dokken og søen, og nabolaget giver rolige baner til spadsereture. Sidedækket er dækket og giver skygge om eftermiddagen. Bonner County Feriebolig Tilladelse # 005. Alle badeværelser har brugerdefinerede flise gulve, granit bordplader og high-end inventar. De 3 fulde bade har strålende i-gulvvarme. Dette er et helt nyt sommerhus med high-end finish og brugerdefinerede tømrerarbejde overalt. for meals, and the sleeping accommodations were perfect. A beautiful clean home! Excited to go back next year! Whole family had a great time. Awesome place. Honestly, I thought about not leaving a review because I didn't want to share how perfect this place is, for fear of having a hard time booking next year. But, the owner and the property manager were so nice to us, and the house was nothing short of incredible... It just wouldn't be nice not to rave. This house is beautiful and comfortable and so luxurious. We love being on the sunny side of Bottle Bay, too. Even the neighbors are friendly and nice. We loved everything about renting this house, and felt like guests, not renters. We didn't want to leave. If I had to say something negative at all, it'd be that the pull out sofa wasn't comfortable, but with the amount of beds in the house, we didn't need to use it anyway. The kitchen is well stocked with upscale dinnerware and glassware and appliances, the bed linens were quality, the beach towels were plentiful (what a change from having to bring our own, too! ), the firewood was replenished with a smile when we ran out. There was plenty of indoor and outdoor seating - we wanted for absolutely nothing while we were there. I could go on and on about all the things we appreciated - that's how perfect this property is. Thank you so much for a week of great memories in a such a gorgeous house on the lake! Lap of luxury and remote simultaneously. We had the best time at our annual family reunion last week in this lovely home on the lake. 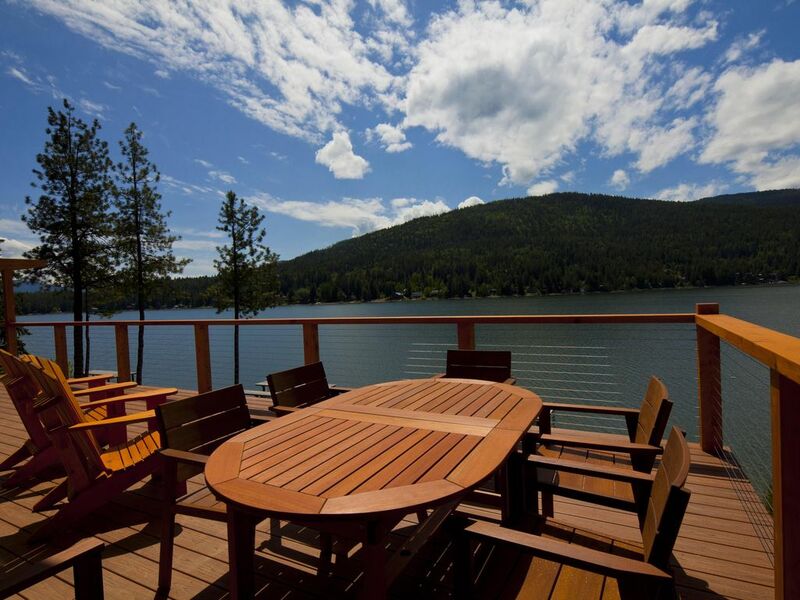 We're a group of three families and have been meeting for many years now, selecting different homes at different locations around the northwest. This home receives our best rating because it's the best in so many ways. The best equipped kitchen ever (!! ), sharing owners who provided beach towels and floaties for the lake, and the amenities of staying in a new home. Bedrooms and baths were perfect. Even the neighbors were friendly and our grandkids played with theirs. Really- this home is all about being in the lap of luxury and being remote. Thank you so much for your review-we tried to set up our lake house for family fun and comfort, and are happy that it fit the bill for your crew. We just completed our second stay at this beautiful house on the lake and we can't wait to come back! The house is wonderfully situated on Bottle Bay, a quieter and calmer inlet on the lake which makes it perfect for those seeking a peaceful haven and also for smoother water activities like paddle boarding and kayaking and swimming. Across the bay at the marina you can rent boats and jet skis and dock them right in front of the house! The house itself is both roomy and beautiful. We loved cooking in the large, modern kitchen. We have great memories of BBQ-ing and enjoying dinner on the deck overlooking the bay! When the weather was hot, you could always find at least one of our party relaxing on the lower patio, lounging in the shade in the comfortable patio furniture. At least once during each stay we've built a fire in the fire pit and roasted marshmallows, a must do! The bedrooms are clean and comfortable and the bathrooms are all beautiful and large. A great house for a family gathering! Between the three downstairs bedrooms there is also a great family room for lounging. Plenty of room for the whole family. If you stay here, you will never want to leave! My group (two sisters, two teenagers) really enjoyed our stay on Bottle Bay over the Labor Day weekend. The house has a simple, modern design that was quite comfortable, giving us plenty of room to sit and look at the lake from different vantage points. The topline bathroom features were a hit with everyone. The kitchen was well-stocked with cooking appliances, etc., so we ate in for most of our meals. We really enjoyed all the different places to sit and look out at the water - from the living room, the upper deck, the lower deck, the dock. Very relaxing. We are hoping to return next summer and make this an annual tradition! Payment is available by check or via VRBO credit card service. Any international credit cards will be charged a $100 transaction fee. Last-minute booking discounts may be available.